The CSTPR blog, Prometheus, was revived in 2016 to regularly feature content from CSTPR core faculty, research associates, postdocs, visitors, students and affiliates to serve as a resource for science and technology decision makers. This new dynamism reflects the new energies and pursuits taking place in and around CSTPR. Below we feature one of the recent Prometheus blog posts. The Arctic is warming twice as fast as the rest of the world, with implications spanning all defining characteristics: sea ice, land ice, permafrost, and cold-adapted communities and ecosystems. The observed changes in the Arctic are resounding, the resulting connections to the globe are increasingly clear, and the science community has a clear role to play in supporting action. The Arctic has experienced the 11 lowest observed summer sea ice extents, all within the last 11 years. At the end of summer, Arctic sea ice today is a mere 60% of the area it covered just 40 years ago, and less than 40% of the volume. A new ocean is emerging, transforming fisheries, ecosystems, and transportation corridors. Governments, industries, and conservationists are struggling to keep pace, scrambling for the best and latest science and observations. There is also growing evidence that diminishing Arctic sea ice leads to a weaker, meandering jet stream over North America, which in turn can be linked to unusually persistent weather patterns and unfamiliar storm tracks, such as those observed during hurricanes Sandy and Harvey. These storms brought remarkable devastation to the Northeast U.S. and Houston, Texas, respectively, while sparking policymakers’ and the public’s attention toward the potential drivers of such events. But there are also the hidden and slow creeping effects of amplified warming in the Arctic. Carbon trapped in northern permafrost (the remains of un-decomposed organic matter from thousands of years ago) equates to 1500 petagrams of carbon, equivalent to approximately twice the carbon currently in the atmosphere. As permafrost—persistently frozen ground—thaws, we may expect 1 petragram of additional carbon released annually to the atmosphere (~ 1/10 of global fossil fuel emissions). This is a critical positive feedback of the global climate system, and perhaps the best example of the now common refrain from the science community: “What happens in the Arctic doesn’t stay in the Arctic”. This equally holds true for the observed rapid melt of the Greenland ice sheet. Greenland melt today contributes a third of the annual increases in sea level, now at 3.5 mm/year. This doesn’t sound like much, but could account for a 6.5-foot increase in some locations (for example, the U.S. Gulf Coast) by 2100. Such cumulative amounts over decades represent a stark deciding factor for the future of coastal cities and settlements (currently 10% of the global population lives along the coast, and is increasing). However, even today, a few mm of sea level rise adds considerably to the storm surge produced by storms that form over a warming ocean. The destruction and trauma delivered by the 50 inches of rain that fell over Houston during Harvey, or the tremendous loss of life experienced during Katrina 12 years ago, raises critical questions for elected officials, city planners, engineers, coastal residents, and tax payers. When do we choose to rebuild versus relocate? How do we protect and build resilience within our most vulnerable communities? Such questions are grappled with by many, yet perhaps nowhere with such urgency as in the coastal communities of Arctic Alaska. Increasing damage from fall storms (due in part to decreasing sea ice that acts to buffer wind-driven waves), eroding coastlines, and inadequate coastline infrastructure have made relocation an urgent priority for villages along Arctic Alaska’s coastline. It’s more than just a challenge for scientists, engineers, and economists; it’s an issue of climate justice and human rights, where Indigenous leaders and village residents alike must lead. How can we expect these vulnerable villages along shrinking shorelines to benefit from federal disaster policy, which has developed to assist single households rebuild following one-off flooding events, and does little to aid cohesive communities in revamping and repositioning their infrastructure and self-determination around critical food, cultural, and spiritual resources that have sustained their peoples for thousands of years? A resident of Utqia gvik, the northernmost village in Alaska, observes open water beyond the coastal sea ice during spring. Photo: Matthew Druckenmiller. Bringing the natural and social sciences into the fold as a resource to address these challenges requires an engaged and interdisciplinary science community that has two-way communication channels with Arctic communities, stakeholders, environmental journalists, and policymakers. The goal is daunting, yet relatively simple in concept: bring the best available science to bear, be available, know your audience, know your limitations, and be willing to engage in discussions across all levels of sophistication. While some members of Congress need to be made aware of simple facts, such as that real people (Americans!) live in the Arctic, others possess a deep appreciation for the dramatic changes taking place and the need for comprehensive approaches to protect infrastructure, safeguard communities, and sustain healthy economies. For a scientist to be a resource, she or he must be able to listen and learn, as much as provide concise, technical, and relevant scientific information. This is the approach of the Study of Environmental Arctic Change (SEARCH), which recently spent a week in Washington, D.C. to connect Arctic science to policy. 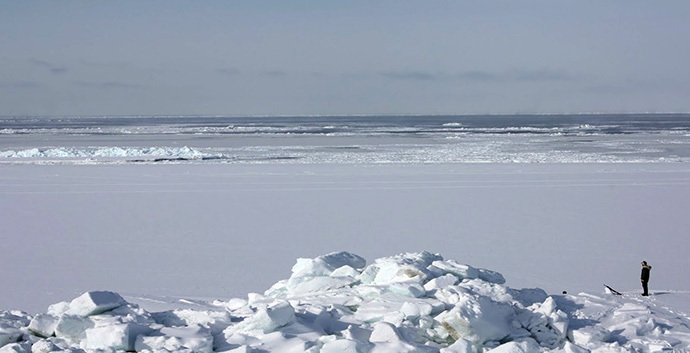 SEARCH is a collaborative program of researchers, funding agencies, and other stakeholders that facilitates synthesis of Arctic science and communicates the current understanding to help society respond to a rapidly changing Arctic. SEARCH currently focuses on how shrinking land ice, diminishing sea ice, and degrading permafrost impact Arctic and global systems. During September 25-29, SEARCH scientists began their week in D.C. with a two-day workshop led by the Metcalf Institute for Marine and Environmental Reporting. Dr. Sunshine Menezes (Metcalf Institute Exec. Director) and her team led more than 30 participating scientists through lessons focused on pitching stories to the news media, best practices for engaging policymakers and agency staff, and crafting compelling presentations for varied audiences. Much for the time was directly devoted toward preparing for presentations and discussions that took place later throughout the week. SEARCH scientists briefed the Senate Arctic and Ocean Caucuses on the Hill (Sep 26), convened a panel of Arctic researchers at AAAS Headquarters to discuss the “Global Implications of a Thawing Arctic” with journalists (Sep 27), held individual meetings with several Congress members from coastal states to discuss sea level rise (Sep 28), and participated in a panel at the Woodrow Wilson Center on “Arctic Environmental Futures: Nexus of Science, Policy, and Operations” (Sep 29). These events led to individual discussions with specific policymakers, journalists, national security officials, and other Arctic-focused audiences, as well as provided SEARCH an opportunity to highlight a number of new 1-2 page science briefs addressing stakeholder questions about Arctic environmental change. These are available at Arctic Answers, which provides short and up-to-date summaries of the current state of knowledge surrounding diverse topics at the interface of Arctic science and policy.